Like millions of Americans, writer and Extra Crispy editor Kat Kinsman suffers from anxiety. 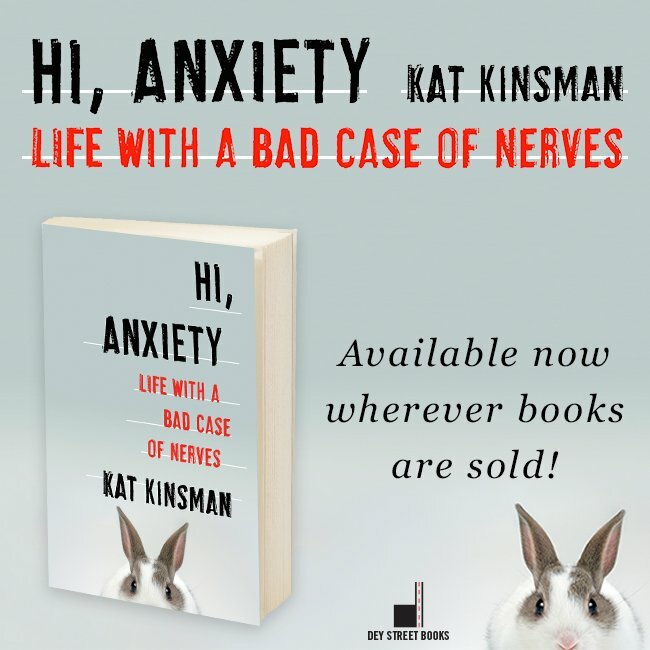 In the first chapter of her new book, Hi Anxiety: Life with a Bad Case of the Nerves, Kinsman recounts the moments in kindergarten when she first realized she was … “nervous.” When asked to read a passage in front of the class, she froze, biting her lips and losing control of her hands, which trembled against her will. For the rest of her life, Kinsman would be grappled with panic attacks, self-doubt, depression and the not-so-basic facets of being a human: Leaving the house. Maintaining relationships. Getting through crowds. Surviving the holidays. Kinsman spoke with PEOPLE about what she wants people to know about anxiety, and the reality of living with it. 1. You can’t always ‘see’ it. Read the rest at People.com. This entry was posted in Books, Hi Anxiety, Interviews, Publicity on November 19, 2016 by Kat Kinsman. And I have a Harper Collins author page and book page, Goodreads page and an Amazon author page. This entry was posted in Books, Hi Anxiety on November 19, 2016 by Kat Kinsman. This entry was posted in Books, Hi Anxiety on November 2, 2016 by Kat Kinsman. 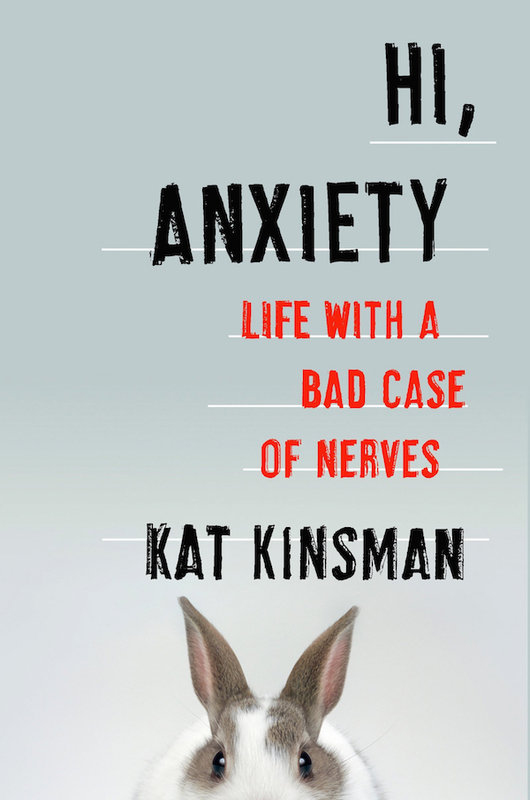 This entry was posted in Books, Hi Anxiety on September 10, 2015 by Kat Kinsman. This entry was posted in Books, Hi Anxiety, Writing on March 17, 2014 by Kat Kinsman. This entry was posted in Books on September 1, 2013 by Kat Kinsman. It’s Padma’s world. The rest of us just cook in it — just mostly without a gigantic LED countdown clock, a dozen cleaver-wielding competitors jockeying for prep space and a mandate to make haute nibbles from the contents of a 7-Eleven’s snack aisle. But if that’s what cremes your brulee and you haven’t the tats, ‘tude and temerity to audition for competitive reality TV, you can live vicariously through this book. Or you can just go online and save the $29.95. This entry was posted in Books, Old Writing, Slashfood Archives, Writing on October 23, 2009 by Kat Kinsman. Chef John Besh’s magnum opus on the food of his hometown could easily be mistaken for a coffee table-style photography book edited by someone with one heck of a food fetish. That’d be only partially correct. Besh celebrates and contextualizes New Orleans cuisine within a reverent, passionate travelogue and memoir based around the ingredients and food rituals of a full year in the Big Easy. In this 374-page volume, the chef, restaurateur (including August, Lüke, Besh Steak, Domenica, La Provence and the upcoming the American Sector at the National WWII Museum), “Next Iron Chef” contender, former Marine and father of four weaves an intimate, illustrated narrative of a life lived deliciously in one of the world’s most important food cities. This entry was posted in Books, Chefs, Slashfood Archives on October 12, 2009 by Kat Kinsman. You know how your friend’s cousin’s boyfriend’s grandma, like, totally killed a neighbor by innocently giving her a batch of her home-canned beans that oops, turned out to have a touch of the botulism? That’s never going to happen to you. Not on Steve Dowdney’s watch. This can-vangelist has culled years of his own know-how, as well as the collective wisdom of generations of Southern cooks, into a rigorous, nigh-on religious canning primer. The recipes are solid — almost a shade clinical — but the opening chapter, packed with equipment tips, altitude and pH charts, preparation terms and step-by-step best practices, could be a stand-alone manual, not to mention the only one you’d ever need to buy. This entry was posted in Books, Canning, Old Writing, Slashfood Archives on September 9, 2009 by Kat Kinsman. I’m not gonna lie — I’m rough on my books. There’s a school of thought treating the physical manifestation of the written word as a sacred object, and I fully respect that. However I, for one, shove an old copy of “How to Cook a Wolf” into the bottom of my bag with the notion that at some point it’ll sustain me on an overextended subway ride. I read “The Devil in the Kitchen” in the bathtub, A.J. Liebling over a lunchtime reuben, and good gosh a-mighty are my cookbooks covered in shmutz. But hey, it’s thematic goo; “Molto Italiano” is spattered in tomato sauce, “Pie” — seen here — is all a-smear in lard, “Charleston Receipts” in Otranto Club Punch and “Staff Meals from Chanterelle” slicked with a fine mist of rendered rind bacon. To my mind, these books are being honored, used, proven. Should these books at some point have a subsequent owner, they’ll know what’s been tested, made and made again. Still, am I dishonoring the object or the authors when I’m getting the books all mucky? I posed the question to Matthew Lee (whose book “The Lee Bros. Southern Cooking” I’ve doused in all manner of pickling brine), and he noted that he and his co-author, his brother Ted have debated pre-mucking-up copies of their book to nix the blank canvas factor. The recipes therein are warm of heart and humble of origin, so it’s not out of character, but would, say, a gellan-gumming of Grant Achatz’s “Alinea” be a crime against the rather expensive and exceptionally lovely object? 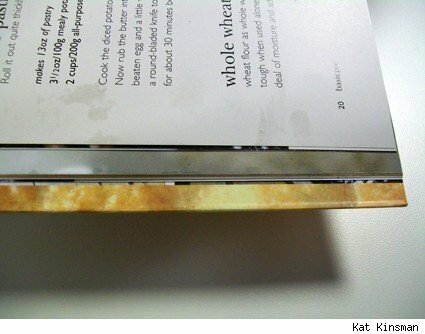 Do you keep your cookbooks in pristine condition, or do you just accept page stains as collateral damage? This entry was posted in Books, Old Writing, Slashfood Archives, Writing on April 2, 2009 by Kat Kinsman.